The University of Richmond has just installed some of the world’s most advanced solar panels. They are just three weeks off the assembly line and are the first installation in the Commonwealth, under a new PPA pilot program approved by the 2013 General Assembly. The system is being installed at the university through a solar power purchase agreement (PPA) with Secure Futures, a Staunton-Virginia based solar developer. The 205-kilowatt photo voltaic solar array was installed on the roof the LEED-Gold-certified Weinstein Center for Recreation and Wellness. The 749 panels cover about 22 thousand square feet of the rooftop. The array will allow the university to generate more than 237 thousand kilowatt-hours of electricity per year, potentially offsetting the emission of more than 364 thousand pounds of carbon dioxide. That is the equivalent to the average annual electricity use of 22 American homes or the annual electricity needs for one campus resident hall. This is part of a comprehensive sustainability program across campus that aims to make the University of Richmond carbon-neutral, by the year 2050. Learn more in this Science Matters video by Charles Fisburne of 88.9 WCVE. Charles Fishburne: The University of Richmond has just installed some of the world’s most advanced solar panels. 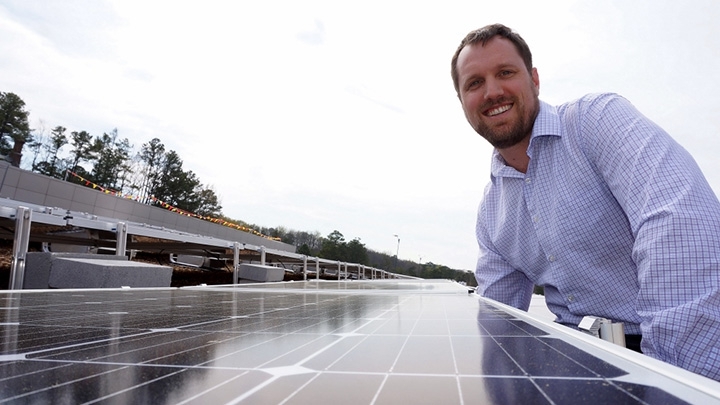 Rob Andrejewski, Director of Sustainability, University of Richmond: So right here, we’ve got our bi-facial panels…and these are Solar World’s Bisun panels…you can see there is glass on top like all solar panels, but on the bottom there is glass on these as well. So the reflections from the sun that hits off the roof, will also generate electricity. Charles Fishburne: These panels are just three weeks off the Assembly line…first installation in North America…designed to produce 25% more electricity than before. Rob Andrejewski: It’s amazing what we have done in the last ten years. Charles Fishburne: Rob Andrejewski, Sustainability Director at the University of Richmond. Rob Andrejewski: One of the things that is really exciting about this is that we have entered into a power-purchase agreement with an installer and a developer…so the developer…we are actually going to be purchasing the energy from them…they are going to actually own this array at the University of Richmond, and we are going to be able to buy energy from them. That had us avoid the upfront costs…and we need more legislation like that to allow people to enter these agreements, so you don’t have to put 20 years of energy costs up front. Charles Fishburne: That power-purchase agreement was a pilot program authorized by the 2013 General Assembly, and the array goes atop the Weinstein Center for recreation and wellness. None of this is lost on the students. Nineteen-year old Maggie Johnson is majoring in environmental studies and leadership. Maggie Johnson: I think it has really given me a more practical hands-on appreciation so I can learn how these kinds of changes help impact. Rob Andrejewski: Well, we have a commitment to carbon-neutrality by 2050…so we are working on reducing our greenhouse gases actively. So there are a lot of energy-efficiency projects. All of our new construction is LEED-Certified Silver or Higher. Our dining program is doing a ton of things. We have a reusable to-go container, a reusable mug container, students started a food-recovery network just this year to capture dining waste that is still of good use to repurpose it to people who are hungry in this community. We’ve got a course in sociology that is examining all of our food purchases right now, to evaluate them on a sustainability criteria…not just to analyze and criticize, but to offer solutions. We have a bike-share program. We are trying to get people outside and on bicycles and not using vehicles…especially single-occupancy vehicles. Our events staff, which runs graduation…they are working on eliminating waste during that period. What’s happening at the University of Richmond that is really special is how distributed an approach sustainability is. There are champions throughout the campus that are doing things that I don’t even know about…whether they are students or faculty or staff. We are not doing our job if the students aren’t prepared to deal with the new world that is facing them. And by establishing programs here on campus that they can learned from….it’s great to do greenhouse gases, but it’s even better to produce students who understand the need for that, and how to do it themselves.